Summary: July’s upbeat trading statement from this medical disinfectants specialist had already signalled these record results. The finer details revealed UK revenue enjoying a healthy second-half performance and overseas operations progressing consistently well. The financials appear to be in order, too, although cracking the United States is taking a bit more time and money than expected. The executives remain confident and have issued bold new projections, which is all reflected by the elevated share-price rating. I continue to hold. July’s upbeat trading statement had already flagged the headline figures of these respectable results. 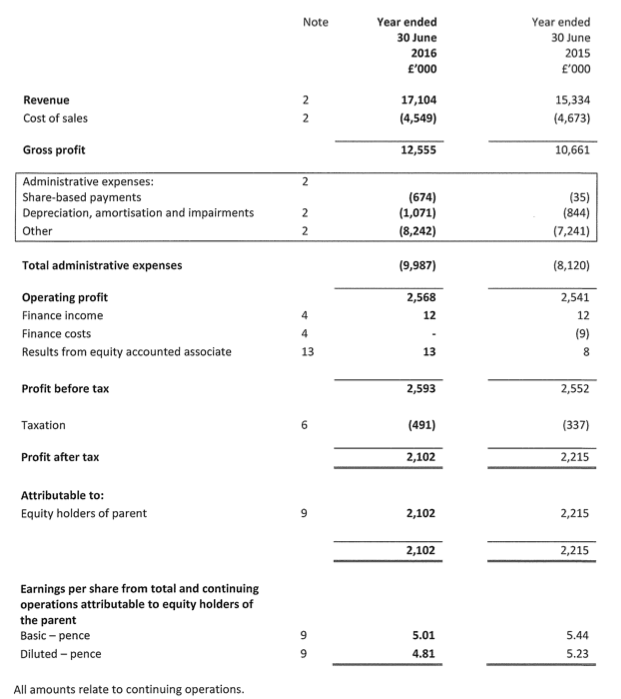 Revenue for the full year was indeed “in excess of £17m” at £17,104k (up 12%) while pre-tax profit excluding share-based payments and foreign-currency gains was indeed “at least £3.1m” at £3,116k (up 17%). Both numbers set new records for TSTL. Basic earnings declined due to the overall tax rate advancing from 13% to 19%. The ordinary annual dividend was raised an impressive 22%, although the improvement was almost entirely delivered through the interim payout. The final dividend was lifted a measly 2% to 2.19p per share, which I suppose is understandable when a 3p per share special dividend was declared during the summer. UK revenue increased by 9% during H2 and, within that improvement, I calculate UK revenue generated from the core medical wipes and surface-cleaning products climbed an astonishing 20%. TSTL’s preceding interims revealed these core products had produced only a 3% UK revenue advance during H1, and at the time management had referred to “the anticipated slowing of sales growth in the UK” and the NHS suffering from “financial distress”. When quizzed at the July open day, TSTL’s executives did not really know why UK revenue had improved so much during H2…and they did not really know why when quizzed again this week. As such, the apparently random ups and downs of NHS ordering remains the only theory for the improved UK result. At the shareholder presentation, management was keen to stress this sizeable increase was not due to TSTL encouraging the NHS to stockpile supplies. Management also claimed greater orders coming through the NHS supply chain — rather than direct from the hospitals themselves — would not make any difference to TSTL. One final point on the UK — I had previously wondered whether substantial price increases on some legacy products had helped boost revenue at home. I now see the results presentation indicating that this was not the case. I calculate international sales of the core medical wipes and surface-cleaning products advanced a chunky 24%-25% during both H1 and H2. Notably, total overseas sales during H2 represented 42% of the group’s top line. The bulk of the international gains came from TSTL’s direct overseas operations, where revenue grew a super 30% to £4.1m. These direct foreign operations are now becoming more productive for the group — in comparison, revenue from independent overseas distributors climbed ‘only’ 13% to £2.6m. * Australia has up until recently sold only one product — TSTL’s flagship wipes system — but regulatory approval has now been obtained to sell other TSTL products. * TSTL’s post-year-end purchase of the Australian operation for £1.1m ought to deliver at least an extra £750k of annual revenue. * The directors were “very pleased” with China, although this division sells only one low-key TSTL device and both the Chinese market and people involved are “very unpredictable”. * Hong Kong suffered due to a packaging problem that has now been resolved. Monday’s results provided a technical case study for calculating share-based payments. You may recall TSTL recorded a £1,015k option charge within its H1 statement. However, the annual figures showed the charge reduced to £674k. The £341k ‘refund’ was due to TSTL changing its share-based payment calculation method from Black Scholes to Monte Carlo. No, I have no idea either about which method is more suitable… but management claimed its auditors advised the company to switch. Normally I’d overlook such technicalities, but I make an exception with TSTL… simply because the options in question were granted — and vested — in rather cavalier fashion (at least to me). I can only guess that TSTL was fortunate that the replacement Monte Carlo calculation method resulted in a lower figure. One day I will have to study exactly how the cost of share-based payments are calculated and understand why companies can use different methods and arrive at different results. For what it is worth, TSTL’s contentious options numbered 1,198,017, had an exercise price of 1p and would vest if the share price stayed at 134p or more for 30 consecutive trading days. If those options were all mine and had vested, I think I would calculate their gross value to be 1,198,017 * (134p less 1p) = £1.6m. One last point on these particular options — the share price has (coincidentally) once again topped 134p for 30 days as of today. I doubt anyone could have begrudged the employees their option payday had it come AFTER February’s H1 results… and therefore AFTER the company admitted its previous revenue target for 2017 would be “unlikely to be achieved”. Meanwhile, the aggregate working-capital movement shows a small inflow of cash — which is quite remarkable given the expansion of the wider business since 2012. The cash flow characteristics pushed the year-end bank balance to £5.7m, which has since been offset by the summer’s 3p per share special dividend (£1.3m) and the Australian purchase (£1.1m). Management revealed the latest cash position to be £3.7m (equivalent to 8.7p per share). The balance sheet continues to carry no debt and no pension obligations. Returns on equity are now running at very acceptable levels, too. I was a little surprised to see TSTL publish some revised three-year targets within Monday’s statement. First off, the previous guidance period ran until 2017. So I suppose the group could have waited another year to fine-tune its expectations. First revealed in an RNS during February 2015, TSTL’s prior guidance anticipated revenue growing by at least 50% between 2014 and 2017 (i.e. from £13.5m to £20.2m) while maintaining the pre-tax margin at 15%. Now TSTL anticipates lifting revenue by between 10% and 15% a year during 2017, 2018 and 2019, while sustaining a pre-tax margin of 17.5% throughout. I doubt TSTL’s executives would once again issue three-year public guidance unless they were ultra-confident of achieving their goals. For some context, UK revenue compounding at 5% and overseas revenue compounding at 20% would produce top-line growth of about 11%-12% during the next three years. Note that TSTL’s new revenue target does not include any contribution from new markets, including the United States (see below). There was mixed news with the plan to launch a handful of products in the United States. Certainly the regulatory timescale continues to be pushed back and the start-up costs involved continue to ratchet up. This time last year, the executives were hoping to have submitted two products for FDA approval by June 2016 — and to receive that approval for marketing by June 2017. However, Monday’s results stated “various scientific protocols” would be submitted to the FDA by the end of this month and it may take until “early 2017” for “all these protocols to be finalised”. In addition, management owned up to dropping the prediction of a 2017 FDA approval and instead now indicates the firm is “on track to generate US revenues during the financial year commencing July 2018”. I guess that could mean TSTL sells its very first US product on 30 June 2019. That date seems a long way off. Turning to US costs, earlier this year management said the cost of obtaining FDA approval for the initial products would be around £600k. The executives also claimed there would be “no material costs of a USA operation” and “no US subsidiary or presence”. 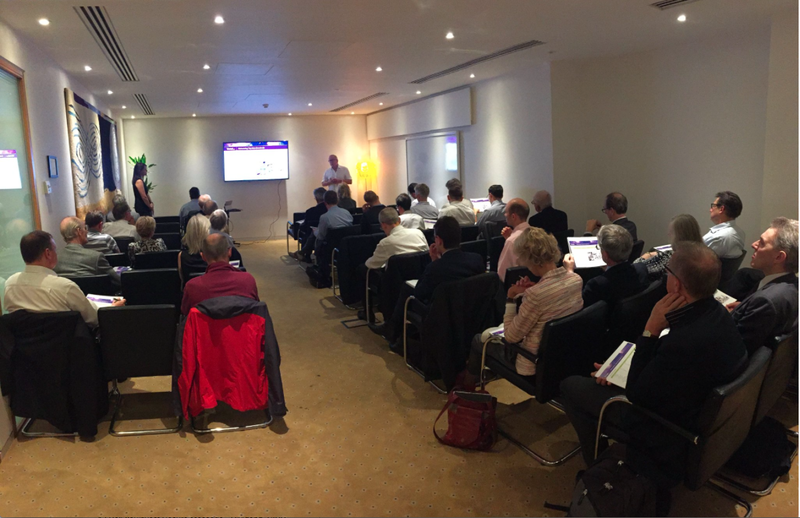 However, Monday’s results presentation indicated US submission costs would now total £990k, with £190k already spent, £500k to be expensed during 2017 and £300k to be expensed during 2018. Furthermore, the directors are now disclosing the likelihood of additional “mobilisation costs” of £500k to fund a support team in the States during 2017/18. On the plus side, at least TSTL revealed its best estimate as to what the US could deliver — a market worth £18m annually based on just the two disinfectant products being submitted for FDA approval. But there was no comment on how much of that potential £18m could actually be secured. All told, I trust the protracted FDA approval process and the growing associated costs are signals that the opportunity Stateside could be somewhat greater than TSTL’s original expectations. It seems clear that the 159p share price is reflecting TSTL’s future growth potential. I’ve adjusted the reported £2,568k trailing operating profit to ignore share-based payments (£674k), foreign-exchange-gains (£151k), intangible write-offs (£125k) and US investment costs (£130k), and also added on the potential contribution from the Australian deal (£200k). After tax at last year’s 19%, I arrive at earnings of almost £2.9m or about 6.8p per share. Subtract the cash position of almost 9p per share from the 159p share price and the underlying trailing P/E comes to 150p/6.8p = 22. Assuming TSTL’s top line compounds at the top end of the 10%-15% guidance and the pre-tax margin is sustained at 17.5%, revenue by 2019 could be £26m and I reckon earnings may then be about 8.6p per share. That estimate would bring the possible 2019 P/E down to 16 based on the cash pile perhaps having advanced to 20p a share. Although the shares don’t look to be an obvious bargain at 159p, I continue to hold because TSTL’s main disinfectant products are repeat-purchase, seem hard to replicate, enjoy respectable growth prospects and produce some pretty good accounts. I just hope the NHS remains a happy and consistent customer and that the investment in the States one day pays off. Credit to TSTL for publishing its annual report on the same day as issuing its full-year RNS results. …it seems to me Monte Carlo was used as the options in question had a non-market based vesting condition. That said, the options actually vested after meeting a market-based condition. I need to look into all of this further. Following the H1 option furore, I am not surprised TSTL’s share-option policy has changed. So it seems the door is now open for TSTL to issue further share options where the option price is below the prevailing market price. The irony is that the 1.2 million options referred to in the Blog post above were granted in August 2015 — i.e. between the publication of the 2014 and 2015 reports — and so clearly contradicted the share-option policy at the time. I am quite amazed TSTL’s revenue progress last year was performed with slightly fewer staff. Indeed, the group’s head count has increased from 96 to only 99 between 2012 and 2016, during which time revenue has advanced from £10.9m to £17.1m — that is some achievement and indicative of the products effectively selling themselves. Revenue per head for 2016 was a very respectable £173k. 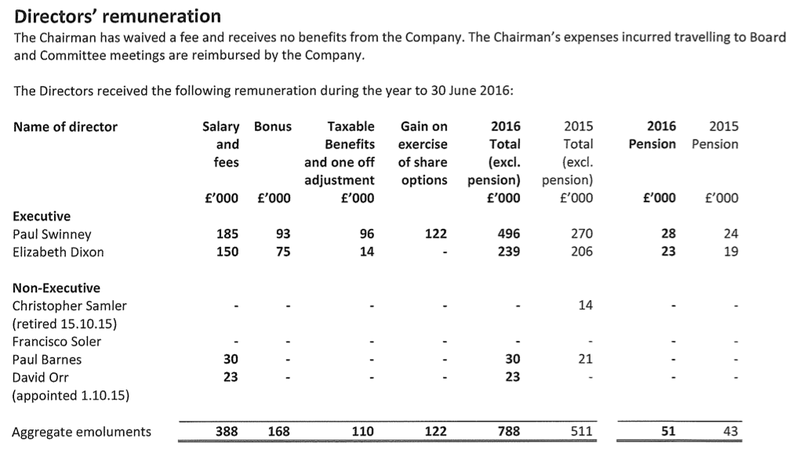 It seems the £5.8m staff cost included a £0.55m performance-related payment as well as the £0.67m share-option charge. Average staff cost excluding the option charge was about £51k, which is not extreme although it has risen from the £42k seen in 2015. “Stretching and transparent” performance targets are now in place and payments are limited to 50% of salary, which is reassuring. The chief exec’s pay climbed 6% and the finance director’s pay climbed 15% in 2016 to align their pay with the median of similar AIM companies. The payments do not appear grandiose in light of the group’s size and progress. (The chief exec also enjoyed a £73k one-off payment to make good an administrative error involving a 2009 share scheme). Seems like a few people have been replaced. I trust product quality was not affected. I wrote in July that I saw TSTL’s new Puffin prototype first-hand. Raising my eyebrows slightly is the claim that Puffin is expected to produce revenue during the current financial year. I wonder if it remains a subscription-based product. So this is impressive. TSTL has very good stock control. In fact, stock is now back to levels seen during 2012 and 2013, when revenue was less than £11m. So hats off to the staff for maintaining that level of stock while growing revenue to £17m. I have to check trade receivables here, just to ensure there wasn’t a last-minute revenue push to deliver the improved H2… and left lots of invoices yet to be paid. Trade and other receivables of £3,080k represent 18% of revenue, which compares well to the 18.3%, 17.9%, 21.8% and 21.3% for the previous four years. You could argue the receivables that are ‘past due’ at 38% of the £3,080k are not low — but the relative amounts are small and TSTL’s history of bad debts is minor. Tristel is a company that could easily be valued at £350m in my opinion over the next 10 years. Because they have products which are popular around the world. so their is a lot of growth left in this company. i’m surprised you sold when they had a profits warning . As that was a good opportunity to buy more shares. Good companies don’t go bad overnight. profit warning can create good buying opportunities. be patient with this one and you will be rewarded. also what happened with buford capital? do you regret selling that one. You should never sell a company just because the share price is stagnating. never judge a company by its share price, always look at the fundamentals. You need to learn to be patient in this game. I sold some shares after February’s interim results because I felt management had behaved in a disingenuous manner. I am sure the board knew at the time of the December AGM that H1 revenue was below forecasts, yet did not disclose that fact when it had the opportunity — and then a few weeks later bagged a sizeable options windfall. And back in February the directors were citing all sorts of difficulties in the NHS for the H1 revenue setback, yet all of a sudden in H2 UK revenue rebounded strongly — and the directors do not know why. This mysterious UK revenue recovery — and the apparent revival of the NHS — is what has underpinned the share-price gains of late. Nobody foresaw the H2 rebound — not even management. True, good companies do not go bad overnight, but in February the directors revealed a side to them that had not been seen before — and I feel I now have to take that into account with what the board says from now on. I have mentioned in subsequent write-ups that TSTL’s products is the quality draw here, not the executives. I never sold just because the share price was stagnating. I sold because I actually looked at the fundamentals and realised the business had become more complex and there was poor disclosure on certain matters. My initial entry was based on limited research and if I had had more time to study the business when I did invest, I would have not invested anyway — if you see what I mean. I’m not too bothered about BUR’s share price now — I have sold shares in the past that have gone on to ten-bag or more. I have also sold shares ‘impatiently’ that have since gone bust. For what it is worth, I think many BUR holders are now valuing the business on an earnings basis, when to me the business remains primarily an investment vehicle and really ought to be valued on an asset basis. There may be some substantial court wins in the pipeline to justify the present valuation — I don’t know. I think you have nailed all of the issues, potentials and uncertainties. I have been buying the dips since 2014, but the current price looks to have everything on board. On its own now I reckon. Given the options numbers, I guess we will see an exercise shortly (I might be confused about this as I thought the debacle had cleared that issue). Many thanks, your clear focus on the business plus the financials is a breath of fresh air. On the face of it, this was not the most impressive of statements — especially in light of the encouraging FY results reviewed in the Blog post above. However, I suspect costs associated with TSTL’s expansion into the United States may be suppressing profit growth at present. “We are delighted that once again we expect to report period-on-period profit growth for the six months to 31 December 2016. H1 2016 pre-tax profit before share-based payments then came in at £1,480k. As such, perhaps H1 2017 pre-tax profit before share-based payment may be £1,680k, which would be 13% ahead of the prior-year £1,480k. Bear in mind that some of the profit advance will be due to TSTL acquiring its Australian distributor during this H1 period. Plus, this H1 period will have incurred expenses associated with the FDA product trials. My notes in the Blog post above suggest £250k may have been spent in this H1 (£500k expected for the full year), versus £190k spent during the prior full year. So FDA costs may be about £150k greater in this H1, which would explain why the profit improvement in today’s statement appears somewhat subdued. Something along those lines, perhaps referring to FDA expenditure as well, would have provided some reassurance within today’s statement. I guess all will be revealed within February’s H1 results. That line appears a bit more encouraging. As it turned out, the subsequent H1 results showed revenue growth somewhat lower than management’s previous forecast, but profit in line. So confirming the business is performing in line with “management’s… strategic financial goals” ought to mean revenue and margins have not veered off course from the bold new 3-year projections I covered in the Blog post above. Nonetheless, it would have been helpful for TSTL to have included a revenue figure within today’s statement… so shareholders could have worked out for themselves whether the strategic goals were still being met. TSTL’s AGM statements for 2013 and 2014 both included revenue figures, but the 2015 statement excluded the figure… for reasons that became clear soon after.